Several years ago, my pastor at the time was really encouraging me to paint prophetically up front. I did not want to, I was comfortable just doing prophetic portraits in the back of the church for individuals. I was with him visiting a church in Va. and I mustered up enough courage to go ahead and give it a try. At first I painted the canvas yellow...and started to paint words with the color purple like, King of Kings, Glory...etc. I was so nervous...I messed up a word...and completely misspelled it. In a panic and so ashamed...I just started blending the 2 colors together to make an ugly swirl of purpley-gold shame...and then eventually...because I wasn't sure what to do, I just set the canvas aside. People at the meeting came up to me and kept asking me, "What are you going to paint on there?" I did not want to talk about it, because I was too embarrassed to tell them, "I just messed up, and I have no idea." I wanted to pretend it never happened. A couple of years later, after I had gotten over my fear, and had been painting corporately in churches...I was led by the Lord to re-paint For You! Liberty at a local church. 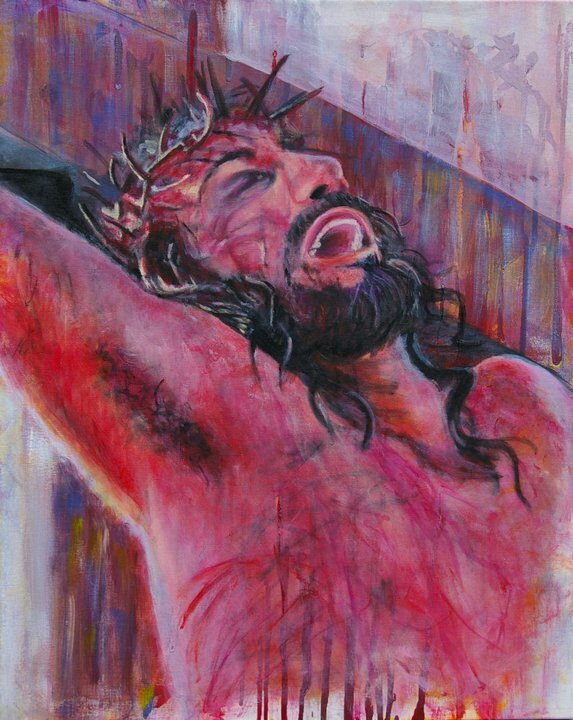 The painting has blood dripping on it, and I knew it would have to be just right to paint it live in church. To prepare I needed to see how the red "blood" would drip, since people would be watching, so I decided to use the discarded canvas to practice with. I went to the store and looked for the perfect color. I got several different ones to try, thick paints, thin paints, and shiny paints, like red glitter to make the blood appear as though it was still wet. Then I set my easel up and began to cover the canvas with the drips of red paint, until the whole canvas was completely full of them. The next morning I checked, and found the drips that were the best. When I was finished, I put the canvas aside, and I had the thought, maybe I should just throw that thing away, because it was definitely ruined and would never have a use, not only was it covered in paint, but there were bumps and ridges now from all the drips. I decided to just keep it, in case I might need another canvas to test something with. One day, I was cleaning up my art studio and I came across the canvas again. I still felt the shame of the moment I had made the mistake, but this time, the Lord said, "Take that canvas out and look at it." I was laughing to myself thinking, "That canvas? What? What are you showing me?" But then the more I looked, I started seeing something in it, painted on it. I kept thinking, "I should paint something with the blood of Jesus dripping on here". Then the next day, someone tagged me on Facebook, in that very same photo!! So there it was...I was tagged. Then I knew I was supposed to paint it...as worship...thinking that maybe people will be touched by just looking at it and possibly even saved. It was Easter time, and seemed like a good way to worship Jesus. I started painting on that old discarded canvas, a canvas that had once been a source of shame for me. A canvas that had been used and set aside...that seemed to be good for nothing...and I began to cover it with a fresh coat of paint. As I did, I noticed that the texture, the ridges and bumps were one of the best parts of the painting and I loved how the red glitter from the paint would shine through. I noticed that it began to go over the whole canvas, more and more as I kept painting. I could see how that horrible color I created from the mistake, that gold and purple swirl coming through from the background, was one of the most beautiful colors of the painting!!! Then I began to weep. I began to say to the Lord and out loud over and over..."I love this painting!" I was touching it with my hands as I painted. I could not stop weeping and saying that I loved it. Something about seeing His face there, and how it looked as though He was laughing and crying at the same time. Then the Lord spoke to me, and He said, "Chrisie, don't you see? You were like that canvas, you had made mistakes that were shameful, you'd been trashed, set aside...and even labeled "good for nothing." But then I, in My love, chose you to be Mine, I covered you with My blood, made you beautiful and useful again. I took the very things that seem to be the biggest weaknesses in you, and made them the most special, unique parts. And now...when the people look at you, they don't see the shame or mistakes, how you were used and discarded...now when people look at you...they just see Me.